A Dutch naval architect and shipping company have teamed up to develop small hybrid cargo vessel. 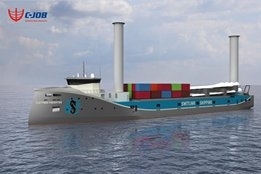 Architect C-Job has come up with a concept plan for Switijnk Shipping for a 8,500 deadweight tonne ship using two rotor sails able to deliver a 14% saving on bunker, according to the architect. C-Job had produced earlier a four rotor design for a 4,500 dwt ship for the company. "We concluded that two larger rotor sails were most effective for this project," said C-Job business manager Jelle Grijpstra. "This was because these would yield a comparable propulsive force to four smaller units. "Also, with two Rotor Sails, one on the bow and one on the stern, there would be no chance of wind shadows affecting performance. "The Rotor Sails were chosen for this project because they are easy to use, safe, reasonably quiet, with no need for extra crew, and cheaper in investment compared to other systems," Grijpstra said. The next stage of the project will see further research take place at the Maritime Research Institute Netherlands. The rotor sails are from Finnish marine technology company Norsepower.